Did you ever notice that the practice of civil debate is a lost art? Leave your caption and I'll fight my way through them before Saturday and declare a winner. Mike LaScala could not resist the urge to crowd ride during the Beastie Boys concert at the Paramus, New Jersey Convention Center. Why does this make me think of ancient Rome? I want my quarter back! That's my quarter dammit! I was saving that for the bathroom. Now give it here you thief! The Congressional Mosh Pit. Everybody was mosh pit fighting! And just when H.R. 1322 was about to come up for a vote... FUMBLE!!! Fifteen minutes into a Democratic filibuster, Glenn Beck turns into a brain-eating zombie. 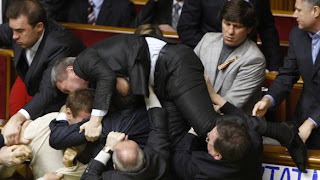 The result of the House of Commons decision to implement back-bencher bouncers during 'Question Period'. Bwahaha, I have nothing at all I can add to these awesome captions! You guys all rock! Dufe, you have a blog award waiting for you at Glitter Frog! Nothing relieves stress like a good game of Twister. Supporters of the gay rights initiative celebrated passage of the bill with a group hug. Dancing With The Stars audience square off with each after boo's for Sarah Palin after her daughter performed. Apparently the 54-40 option was voted down.